Every year there is at least one lecture I eagerly await and look forward to, namely the Quinn Memorial Lecture Series. It has been my fifth attendance over the last six years, with my first one being Michael Gazzaniga’s exquisite lecture entitled Free Will and the Science of the Brain. Unfortunately, I had to miss last year’s lecture by Dr Robert T. Knight because the date and time interfered with my work schedule, but I had been luckier this time around. Although it certainly did not look like it at first. The scheduled talk Learning and Attention in Infants: The Importance of Prediction in Development by Distinguished Scientist Richard Aslin was suddenly canceled and postponed to a later indefinite date. No reason nor future date were given at the time. Could it be that my brain would have to go two years in a row without the much needed and much desired annual adrenaline shot of knowledge? Thank goodness, my worries were unfounded, and there I was seated upfront with my smartphone in hand to take notes in preparation for this blog post. I did not know what to expect and on paper, at least for me, the topic at hand about how infants learn language and make predictions about their surroundings did not have the similar emotional impact on me as did previous topics and titles of this wonderful series. There was certainly nothing wrong with the subject, but for me personally, it came about a decade too late as my son has already taken his first steps into the preteen period. More importantly, I did not wish to hear in retrospect how I may have potentially failed him as a parent in terms of language learning and / or behavior. Yet again for a second time, my worries were entirely unfounded. The talk itself was much more interesting and engaging than I had imagined. First, Dr. Aslin told us how infants learn through auditory statistical learning. This means that they break streams of words, which are for them initially nothing but random sounds, into auditory chunks, hence creating word boundaries. These boundaries are often signaled in fluent speech with pauses, such as taking breath. These word chunks then are basically processed and analyzed by the infant brain to make predictions. In order to be able to better understand and predict their surroundings, babies have the tendency to listen and pay more attention to novel and infrequent words and tones. Why? Because by knowing and establishing certain patterns, they can better understand the rules. This is not a case of merely memorizing words but also looking past them for meaning (vocabulary as a symbol of a designated thing / event in the world) and learning about the inherent rules (grammar, sentence structure and appropriate word choices). In a way then, it is memorization plus generalization, respectively known as model-free and model-based learning; the latter of which is generally designated as smart, abstract and flexible ways of comprehension, while the former is rather unfairly treated as the opposite of all those epithets. Certainly, there is also incidental learning. This means that we absorb knowledge and information without particularly focusing on the given stimuli. This type of learning would occur when one is performing a task by also taking in background noise or information in an almost automatic or subconscious manner. Evidently, paying attention is much better suited for learning, but even when we do not notice stimuli implicitly, we are still aware of and capable of remembering strands of information around us without having to specifically focus on them. The manner they tested all of this was very interesting. The researchers inundated infants with random sounds and stimuli, both in terms of nonsense words, i.e. random syllable sounds as well as tones. Babies tended to be interested in new stimuli, but whenever they managed to discern a clear and repeated pattern, they would lose interest. This occurred because infants were able to predict the next sound, so the sequence did not provide any novel information for them. Once a pattern was established, the baby moved on to something else … unless there was an unexpected result. That is, if they were expecting a given sound to follow, but either it did not, or the pattern was changed, then the element of surprise would warrant and elicit their attention again. This happens mainly due to the structure of our brain. To clarify this tendency of the brain to create, establish and predict patterns, they conducted an interesting experiment with pairs of tones. The researchers would play the sound of two honking horns beep beep. After repeated exposure, the baby expected them to come in pairs, yet when the researchers omitted the second beep, the brain nonetheless supplied it. This was discovered by hooking up wires on babies (no worries, this is harmless and painless standard procedure), thereby noting the infant’s brain activity. In other words, when the brain registered the first honk, the second one was immediately supplied by the brain, regardless if it was or was not there! Since our brains are wired to make sense of our environment in terms of words or tones, we would use top-down processing once a pattern has been established, meaning that the higher structures of the brain would override the lower ones. In the previous experiment, the higher brain regions literally expected the double tone. Once inferences were made, babies would then allocate attention to new information. This was observed by their behavior and reactions, such as looking longer at unexpected stimuli or looking away from expected, hence “boring” and unstimulating stimuli. In that sense, the brain works tandem with behavior, we are able to see connections and patterns and then start looking for them, hence it is the brain structure that is grounded and established first before the behavior sets in and manifests itself. About 9 months of age, infants start searching for hidden objects because their brain - and with it their imagination - has developed to a state where the infants are capable of doing and perceiving such a thing; by around 18 months, they can produce two-word sentences. This seems to be universal and is caused by brain development growth and changes. Yet some of the startling, if not downright shocking, finding was in relation to premature babies. It turns out that they can be at a significant disadvantage when it comes to their brain development although this may not be immediately visible or discernible in their behavior. Put differently, premature babies may act and behave the same way as other infants, but their brain is less developed than their full-term counterparts. That sent shock-waves down my spine as my son was born prematurely! However, if you have premature children, or if by chance, you are one yourself, keep in mind that this is not always the case. First off, each case or person is different, and it is not necessarily a disadvantage to begin with. In fact, the premature baby may make up for brain development at a later stage. Due to the plasticity of this magnificent and complex organ of ours, the brain can compensate for parts that have not fully developed, even more so at a younger and developing age. We should also note that the studies were conducted with babies that were significantly premature by about a handful of months and not by a mere month as it was in the case of my son. Moreover, there are two other general factors that are significant and essential for learning as well. One of them is the fact that salience and prior knowledge tend to drive attention. Anything that is surprising and simply, or maybe ostentatiously, stands out will draw the attention of infants, an observation that is probably equally true for the adult age. The commonplace, however, is generally not worth a second look. The other factor of importance is what is generally known and referred to as the Goldilocks effect. This simply means that if the information or stimuli presented is too simple or too complex for the baby, he or she will simply look away and lose interest. The Goldilocks effect plays also a significant role when it comes to stress and anxiety of children at school; optimal attention and learning is usually achieved when the material and / or environment is neither too comfortable and relaxing nor too stressful and exacting. The middle ground, i.e. the Goldilocks effect, is usually optimal for learning. But another question that arose was why was it that we as adults lose that infant ability to make sense of our environment? For instance, this type of processing information would be most useful when learning a second or additional language. Why was the same process not supplied to us at a later stage since it would make our language learning – and life - so much easier? Part of the problem stems from the fact that as adults we have already established preconceived and set ways of learning and of reacting to our environment, commonly known as entrenched learning. Since we can make more and better sense of our surrounding, and we already have a plethora of prior information and knowledge to select from, we can predict it much better. As a result, and for better or worse, we are not so much drawn to new stimuli and information, but, in a sense, we lose some of our capacity for curiosity and wonder. But this is perhaps not the only reason we become somewhat jaded as adults. 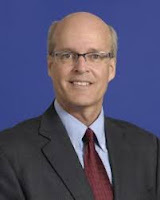 The other driving force, an issue that came up during my personal conversation with Dr. Aslin afterwards, was anxiety. When we are young, we are generally driven by our anxiety to make sense of everything that is around us, as it could spell potential threat and danger to our health and wellbeing. Once we have sorted out the information, we somewhat lose or at least soften that anxious edge. With less anxiety, there is also less need to fear or worry about new stimuli. Dr. Aslin called this the dichotomy of an exploring baby versus an exploiting adult brain. While as infants, we strive to look for clues and knowledge to make predictions, as somewhat “jaded” adults, we want to use whatever new knowledge we get our hands on to better serve our benefit and purposes. Most of these developments may origin in the brain and are hence automatic and not necessarily within our control. This has repercussions in terms of language learning as well. Our life does not so much depend upon making sense of the world since we have already more or less successfully passed through that stage in our younger years. However to finish on a more positive note, we can (and I would say should), despite our brain and age, preserve a sense of wonder by occasionally feeding the child within us and hence ensuring that this worldview or way of interpreting the world is still kept alive and well. Deception is much more common than you may think; we can encounter it pretty much anywhere in all shapes and forms. It could be online and on television in the form of fake news or misinformation, it may be your teenage son or daughter, your spouse, your parents, and it may be even rampant at your work place. In fact, it is at work where deception often feels most at home and sometimes even works overtime. As people want to gain the upper hand over their competing colleagues and since they wish to put themselves in the best possible light in front of their superiors, they may opt to spread gossip or even lie straight into your face. Others are either too eager to please everyone at work by resorting to unabashed and bountiful flattery and hypocrisy, or they may constantly brag about how wonderful they are and keep mentioning and rubbing in their supposed accomplishments. Their aim is to climb up the corporate ladder, and since most of them are adept at manipulating and lying, and, more importantly, making you believe and swallow their lies, they indeed succeed. In a much lesser degree yet undoubtedly to a certain extent, I see similar deceptive behavior among my college students. While a good majority of them are honest, some can come up with the most brazen and even shameless lies to attain passing or passable grades. At times, I marvel at their efforts of being disingenuous where in addition to downright lying, they resort to various inventive forms of cheating and plagiarizing. I just wonder if that skill and zeal had been applied to the work at hand, it would have most likely provided at least decent results. But I shall not bore you here with the life of a teacher that can be both exhilarating and frustrating, so I shall get to the topic at hand on how to spot a lie and a liar. This is indeed a magnificently useful skill to have in life, especially since deception is so commonplace wherever you may find yourself. 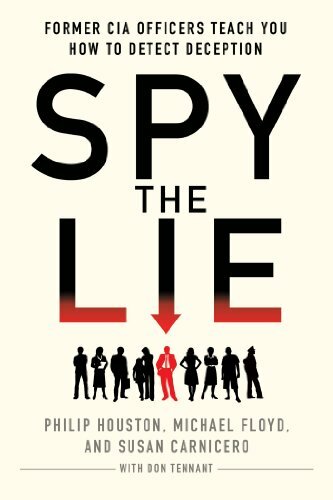 In the past, I would rely on my gut feeling or on visible and evident nonverbal cues to draw conclusions, but now thanks to the wonderful book Spy the Lie written by former CIA officers I can come to a better and much more accurate verdict. Detecting deception is what officers in the field must engage in on an ongoing basis, and it is not only crucial but rather of utmost importance since the lives of people could be at stake. Throughout the years, these CIA officers have put together and developed a method to spot deception in others and now we can all reap the benefits from their research and personal experience in this handy and nifty book. I believe that this book should be mandatory for all police and customs officers as well as all those who engage in interrogations or interviews of various types, but it is also incredibly useful and helpful for those of us who simply want to know if others are being truthful to us or not. So how do we know if somebody is indeed lying to us? Most of us engage in what is called global behavior assessment. What this entails is that we tend to look at the overall behavior, and then based on the data we have received, we make a decision. However, this is very cumbersome, often time-consuming as well as distracting. Instead, the authors propose to focus on salient and specific cues and signals of deception. The nonverbal component is often emphasized in many books and television programs, but it is only part of it and can often be misleading. For example, when a person appears nervous in front of us or if they engage in closed body language, such as crossed arms, that may signal deception but not necessarily so. They might be nervous because that is their personality, or they just might be comfortable sitting or standing in that position. The main thing is to closely observe the reaction to the question. If they have appeared relaxed and suddenly tense up or engage in closed nonverbal behavior when you pop the question, then that may be a sign of deception. In fact, the main takeaway here is to be attentive to any salient clues five seconds after the question has been posed. That would represent their instinctive reaction to the question. In fact, we tend to think about ten times faster than we speak, so by the time you finished your question, the other person has already had time to process it and come up with an answer, either true or fabricated. So what are suspicious gestures to look out for? They may be swallowing, clearing one’s throat or looking away immediately before answering the question, as well as grooming gestures, such as adjusting glasses, ties or shirt cuffs, and strands of hair with women. Interestingly, sweat management is another helpful clue. The sweat itself is not the problem nor the giveaway, but when they wipe it off, either with or without a handkerchief, then it becomes significant. Also, the deceptive person may suddenly tidy up their surroundings by adjusting and readjusting a cup of coffee or moving a pen from one side to another. All these behaviors are often unconscious ways of dealing with and dissipating anxiety. There is also something known as verbal / nonverbal disconnect. Generally, our brains tend to connect the language with its matching gesture, but when you notice discrepancy, it may not be a good sign. For instance, the person says "no" while nodding the head. One must keep in mind that nodding and shaking heads may have different connotations in different cultures, so this should be taken with a grain of salt. They may also laugh or smile inappropriately while discussing a serious matter or issue and that is a potential red flag. Another gesture involves hiding the mouth or eyes. If the person does the former, it may be a natural and instinctive way of covering up one’s lie, especially when they are responding to the given question. Also, when we are deceptive, we would avoid eye contact because we want to shield ourselves from the reaction of those we are purposely and intentionally lying to. Or the person might touch their face, bite or lick their lips, or they may pull on their ears. This occurs due to one’s anxiety as circulation focuses on vital organs and muscles in the fight or flight response. Hence the itchiness is caused due to a lack of blood in certain body parts, predominantly the surfaces of the face, the ears and the extremities. Finally, to wrap up the body language cues, there are also anchor-point movements. If a person is sitting, the anchors would be their back and feet. For example, if a foot is in the air and moves or one’s hands are resting in the lap, that might be another method for dissipating anxiety. For this reason, it is best to interview or interrogate people in a chair that has wheels and with movable arm rests so that those behaviors can be amplified, hence making it easier to notice the anchor-point movements. Throughout the book, the officers emphasize two important points. One that we need to have what is considered an L-squared view of the other person. That means we need to actively Look as well as Listen to their words and scan them for deceptive clues. Second, in order to reach a verdict, we need not just one but a cluster of deceptive behaviors. The more deceptive behaviors you can spot, the more likely the person is guilty of deception. What should we watch out for when it comes to verbal content? There are various methods and strategies that are used to hide or conceal lies. One of them is simply the failure to answer a simple and straightforward question. That may occur because the person in question is trying to figure out just how to get way with their lie. Yet this behavior on its own and in isolation does not immediately spell out deception unless they are combined with other cues. Another one would be denial problems. If the denial is expressed not just as a simple “no” but is accompanied and followed by statements like “I would never do something like that,” then you need to count it as a possible form of deception. In fact, the person may intend to deflect from the question and emphasize their position and reputation, neither one of which would be a good sign for them in this given context. In either case, if they add unnecessary details or elaborate their answers, it may point towards deception. Another couple of tactics that potentially spell out deception is the reluctance or refusal to answer. This is the proverbial “I cannot answer the question” spiel or the suggestion that you’d be better off asking another person that same question. Or they might simply repeat and reiterate the same question: “So you’re saying that I cheated on the assignment?” This type of behavior is meant to fill in awkward moments of silence so that the person can gain time to come up with a good instead of a truthful answer. This behavior can also come in the form of a nonanswer statement, like self-evident but dishonest statements of the ilk of “I’m glad you asked that,” “That’s a good question,” or “I knew you were going to ask me that.” This often demonstrates that the person is worried about something. Moreover, they might provide inconsistent statements or contradict themselves in the course of the conversation as they are trying hard and sometimes desperately to keep their story straight. Or they may simply go into attack mode. Since they are afraid of being caught, they might as well accuse you of wrongdoing (in psychoanalytic terms known as projection) or they may attempt to impeach your credibility or competence with sarcastic and pointed questions such as “How long have you been doing this job?” This is also when kids burst out with their typical “Why do you always pick on me?” or “Why don’t you trust me?” In either case, not a good sign. And then there are referral statements. They might refer to having already explained something or the person may claim that they have previously talked to someone else about the same issue. Through sheer repetition, they might get you to actually believe what they are saying. Or they might invoke religion and swear to God, which is generally not a good signal either. And of course, there is the often used strategy of faking temporary amnesia with often heard statements like “Not that I recall …“ or “To the best of my knowledge” or “Not that I am aware of” or even the staple answer of “As far as I know…” Of course, these answers may be valid in some cases, but in others, they are dubious if not downright suspicious. Moreover, we also have qualifiers. There are two types of them, the exclusion and the perception qualifiers. Exclusion qualifiers are statements like not really, basically, for the most part, probably and the like. The second type of perception qualifiers involve statements like honestly, to tell you the truth, frankly or to be perfectly honest. If you are honest, you do not have to say you are and why add the adverb “perfectly” there, for instance! What qualifiers do is they enable people to withhold certain information. You cannot just basically say the truth; you do, or you don’t for that matter, but we need to be aware that they may possibly be speech habits and patterns that we simply employ. Finally, there are those highly popular and often used convincing statements. In that case, the deceptive person would give you a string of statements that are supposed to highlight their honesty, good standing or reputation so that they can convince you they are innocent of any type of wrongdoing. These people might point out that they are good and decent people, that everybody can vouch for their integrity, and that they have worked up a reputation in various fields of their lives. The goal here is not to provide information but to convince of their supposed personal integrity. And that is another major red flag. That may be even noticeable in simple questions. If there was a theft at a company and people are interviewed for that reason, the truthful person would simply state their profession: I am an engineer, or I am a language instructor. The deceptive person might go into too many unnecessary details about what they do, what their responsibilities and duties are and how they have worked for various years at the agency or institution. That is already a potential warning sign that deception may be at work. So there you have it! This book evidently contains many more examples and backs them up with personal experience as well as actual snippets of news items and interviews. If you want to put this to practice, you can watch video footage of famous impostors and liars, including but not limited to presidents like Richard Nixon and Bill Clinton, or murderers like Ted Bundy, Susan Smith, or the Jinx’s own Robert Durst (yes, I’m pretty sure he’s guilty). As with anything, the more you practice, the better you will get at it. And then you might even apply it onto the real world. But as the authors claim, this is indeed some superpower that you are given, and you must be careful with how you use it. You can apply it to anyone you wish, but it is advisable to avoid using it on your spouse or significant others. Just saying. A couple of weeks ago I had a dental appointment during which I had to sit still for a good couple of hours and let myself be pricked with needles to have my cavity fixed; in addition, I needed to undergo repeated attempts of a crown impression on the neighboring tooth. This second tooth had broken off in half probably due to the fact that I was grinding my teeth overnight, an unconscious habit I have picked up since childhood. This was most likely due to stress, which, when facing dental appointments, tends to increase for some reason or other. As I was laying there with my upper jaw gradually but steadily losing sensation and becoming downright numb and while I was awaiting - but not looking forward to - further invasive procedures, a thought crossed my mind. Although this was a far from ideal situation and I would have much preferred to bolt home to safety, all things considered, it was not that bad. 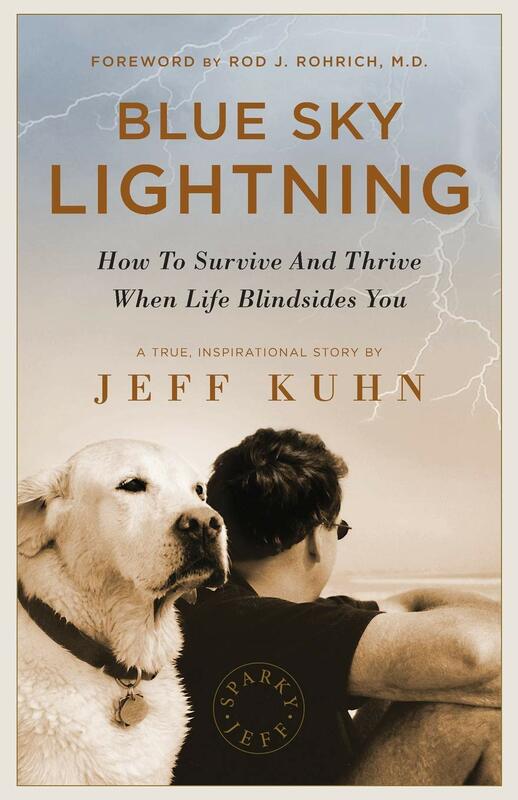 Some people, Jeff Kuhn, for instance, had to undergo tremendous amount of pain and suffering, and in his case, he not only survived but wrote a book about it to inspire us all. When my own situation had reached its most uncomfortable moment, I was reminded of a medical practice that is called “debriding,” which in my mind could only be second to torture. The idea of a bath seems rather pleasing, but debriding is when nurses use scissors, razor blades, and knives to cut off the burnt skin segments of one’s body so that healing can occur. As parts of the skin and flesh are scraped off, the patient must be experiencing tremendous and excruciating amounts of pain. In other words, whatever was occurring to me in that dental office was not even a fraction of what must be occurring during such a debriding session, which used to form part of the horrendous but necessary daily routine of Jeff Kuhn. In his best-selling book Blue Sky Lightning, a copy of which the author himself had kindly sent me for a book review, he describes how disaster had struck his life not on one but on two separate occasions. The title refers to an unlikely but possible event when one can get hit by lightning even though there is clear blue sky overhead. Everything looks fine and suddenly out of the blue, a bolt of lightning would hit you. Now getting hit by lightning is a rare occurrence, but blue sky lightning would be even rarer. This may occur when there is a storm a few miles away and somehow it dislodges and unleashes a flash of lightning somewhere else. In the book, it is used as a metaphor for being blindsided by life and being subjected to painful events or suffering when one least expects it. The first occurrence was a mysterious and unexplained fire that left Jeff Kuhn with more than 80 percent of his body burnt. He had first, second and third-degree burns, and his chances of survival were extremely low. At one point, when he was still unconscious and hooked to machines, he was given final rites by a Catholic priest because his doctors and family members expected the worst possible outcome. Somehow, he managed to pull through and survive. Yet the harder part seems to have come after that, namely the subsequent recovery period that lasted for years. Despite countless surgeries and daily debriding, just the thought of that sends shivers down my spine, he was given a very low prognosis of ever reaching normal health. When Jeff pressed for his chances, he was given seven to ten percent that he would regain normal functioning. Yet unlike most who would feel discouraged or lose hope when faced with such low odds, Jeff Kuhn felt motivated that there was still a chance. The situation was not hopeless or futile, but it meant that he would have to do his utmost to make it happen. As someone who was focused and determined, not to say obsessed, he saw all of this as a challenge to be overcome. Jeff told the doctors that soon enough he would show them that full recovery was possible; one day they would see him dunk a ball into a basket in front of them, a feat deemed on the verge of the impossible. But the main emphasis lies on the fact that anything that is not completely impossible may be indeed somewhat possible, but only if you are willing to take continuous and persistent action in that regard. For instance, he would have to do daily and painful physiotherapy. Since his muscles tend to detract at rest, it meant that progress he had made during the day would be partially reversed overnight. In the middle of all of this, when he was discharged from the hospital, he faced an empty house, devoid of furniture and wife; the latter had left him and had taken everything with her leaving him with a 300 dollar check to make ends meet. In fact, she ran away with his dentist of all people, and Jeff wisely switched dentists after the incident. Somehow, Jeff Kuhn managed to pull through. When he was at the intensive care burn unit, one of the main threats to his health was the danger of infection. As the body is fully focused on recovering from its trauma, all its resources are focused on repairing the damage. But that also means that the immune system cannot function as well as it should as all the body’s energy is actively focused on survival. In fact, most people tend to die from infections and not from the actual burns; as a result, the burn unit was not only kept stringently and spotlessly clean and regularly sanitized but visitors and guest were kept to a very minimum. Throughout his stay, Jeff had to accept myriad challenges to his health and well-being alongside pain and limitations, but he still maintained his head up high and stoically faced the direst of circumstances. His social network consisted mainly of doctors and nurse staff who took care of him and who treated him quite well. He also bonded with some of the other patients. There were two of particular interest. The first one is a heartbreaking tale of a three-year-old boy by the name of Eric who had been put in a scalding hot bath and had sustained third-degree burns on his legs. Eric would lighten the place with his good mood as he was wheeled around the burn unit premises in a red wagon, and he would daily stop by and greet the author on his way, something that the latter always looked forward to. Yet one day the wagon failed to show up. Unfortunately, the boy had succumbed to his injuries and had died leaving the intensive unit much more desolate than before. The second notable patient was a macho type kind of guy who would feign to be strong and invulnerable in the outside world but was constantly screaming and complaining that he could not accept or bear the suffering he had to face in that situation. Conversely, Jeff used to be someone who generally had a very low pain threshold and his friends would comment how he was complaining about simple scratches. And yet, there he was facing some of the most intense levels of pain imaginable and holding up much better than those who claimed and proclaimed themselves to be “tough” guys. One of Jeff’s main strengths and what also propelled not only his acceptance but also resilience in this situation was his sense of humor. For instance, in an odd yet affecting amount, Jeff advised the screaming macho guy who adamantly resisted and refused to take part in those debriding baths to bark like a dog throughout the ordeal. Jeff started and soon enough his fellow patient followed suit, and somehow, the other patient managed to get through the sessions not unscathed, but much less so. Beside humor, it was hope that was the rock that stood steady regardless of the turmoil and torments that were surrounding Jeff on a steady basis. He firmly held onto his unwavering hope that things would eventually get better after those difficult moments and situations. Where most of us, especially those macho guys, might feel discouraged and give up hope, Jeff did not do so; he put up a fight. His religion inspired and perhaps guided him throughout his suffering, but in the end, nothing was granted for free and he, like all of us, needed to earn his karma points. Faith is essential and most useful in this; however, merely on its own it is lifeless and futile. But when it is combined with determined action and focused willpower, it can literally move mountains. When Jeff not only managed to survive but get well enough to be discharged from the hospital premises, he continued to work on himself and to continuously improve his health. He managed to work out with unwavering discipline and gained muscle mass; in fact, he was fitter then ever before. Evidently, he had his “battle scars” as he used to call them, but he was lucky enough that they were for the most part not visible. After all those skin grafts and operations and thanks to the intense and arduous work of his dedicated and caring health professionals, Jeff looked and even felt the best he could under the circumstances. Finally, things seemed to be going well when the second disaster struck: he was diagnosed with an unknown and rather rare neuromuscular disease. There was no explanation except that it looked like his nerves were dying causing him intense pain. But even then, Jeff took solace in the fact that it was an unknown disease. What that meant is that anything, including full recovery, was still possible as none of the doctors could pinpoint a reason for nor could they label this strange disease. Yet through his previous experience, Jeff had built enough resilience and stamina to face this new obstacle. It was certainly not what he would have wanted to happen, but instead of denying it or victimizing himself or even blaming God or other celestial circumstances for his plight, he accepted it, faced it and, once again, managed to overcome it. As Jeff states it himself, throughout his suffering, he had support and unconditional love. It might not necessarily be from the people you expect, but it is there in certain individuals who want the best for you and who not only root for you when you are down but also help you get up. For instance, one of his acquaintances offered him a place to stay for free until Jeff would get his life in order. Nonetheless, his most unwavering support may have come from man’s best friend, his dog Sparky. She was, more than anybody else, the one who always stood by his side accepting him through thick and thin regardless of what he looked like or how much or little money he had in his bank account. Indeed, when he eventually loses his faithful dog years down the road, we feel his pain of losing his beloved life-long companion; yet just like him we are grateful to have and have had true friends and kindred spirits in our life in whatever shape or form they may have come. This book is inspirational not only because of its many valid lessons it teaches us but also because the afflicted person has pulled through in flying colors. He has managed to overcome his many obstacles in life and now lives a relatively financially comfortable life and has been blessed with a beautiful family, including a son who is bound for college. He turned his years of pain and suffering into gold by reaching out to all of us though his book. Of course, he is not the only one who is suffering; in one way or another, we all do. Some evidently more and to a higher degree than others, but we all have our own crosses to bear and our personal share of ups and downs. Yet this type of determination that Jeff Kuhn depicts and personally represents and embodies is most commendable, and we can be inspired by it regardless of what difficulties it is we are facing in our own lives. Now that is indeed inspiring!